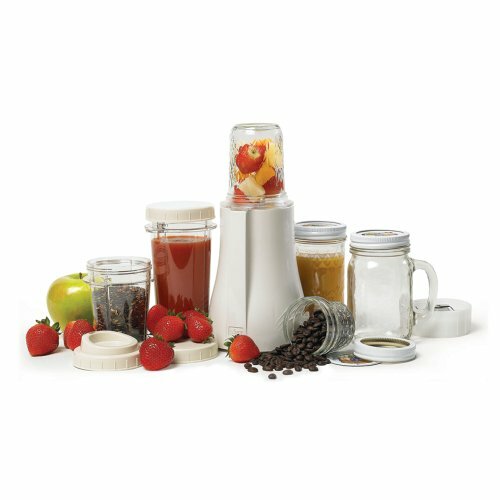 Looking for blenders that fit mason jars? You're in the right place. We've rounded up 5 of the best mason jar blenders so that you can blend and sip in style! NOTE: You need to be EXTRA careful when blending with mason jars - especially glass ones. If the glass isn't heavy duty enough, it can crack. Be sure to follow all directions properly that come with these blenders if you decide to get one and take the necessary safety precautions. Now let's get to the blenders.. Complete with two mason style jars, you’ll be able to blend your smoothie or drink and take it with you anywhere or easily cap it and store it in the refrigerator for later. Thanks to the one-touch operation, you don’t have to worry about using two hands to operate this blender, making it ideal for anyone who is very busy in the kitchen and doesn’t have a lot of time to spend worrying about whether or not their blender is working the way that it is supposed to. 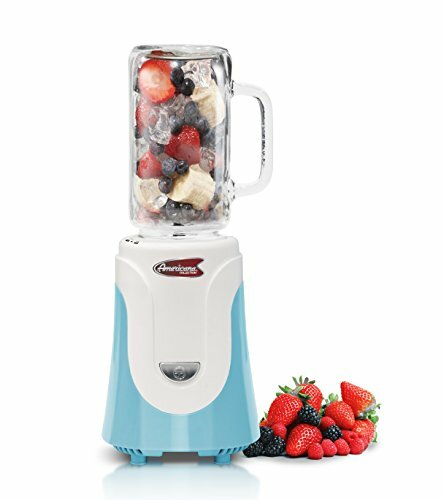 This blender has a fun retro look that a lot of people love in their kitchen, and the powerful motor features 250 watts that will easily allow the blades to crush through frozen drinks and ice so that you don’t have any chunks that are left behind. At just over 5.5 pounds, this blender is sturdy enough to operate without moving all around your countertop, which is a concern for some lighter blenders. There is a three-year warranty that will protect you if the blender breaks or stops working. The included drinking lid makes it easy to drink your smoothie on the job, while the included cap allows you to store items for later. Great size for a single serving. 5.5 pounds is heavy enough to keep the blender in place, but not so heavy that you can’t easily lift and move this kitchen appliance. Is able to blend quickly and produce smooth smoothies and drinks. There are reports of a bad smell while the blender is running. Some users report that the blender smells like burning rubber every single time that they use it. Black paint may wear off and get into the food you are blending. The 20-ounce mason jar included with this blender is large enough to allow you to blend ample amounts of salsa, juices, or smoothies to share with others. One of the reasons this blender is so popular is that it comes with a very durable stainless steel blade that is able to crush not only frozen fruit for the perfect smoothie, but also ice, without any problems. With two fun colors to choose from, it’s easy to pick one that will look great in your kitchen. While you can easily blend any warm or cold drinks, sauces, or dips, you don’t want to put anything hot in the blender as the pressure can build up and cause a problem. If you have problems with hand strength, arthritis, or are simply unable to lift heavy items easily, then you will love how lightweight this blender is and how easily you can move it from the countertop up to a cupboard for storage. Enjoy taking your smoothie to go with the spill-proof lid and straw that won’t allow any of the drink to leak out. 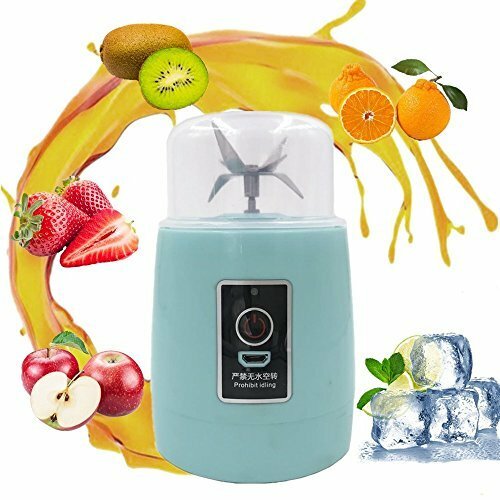 The blades are powerful enough not only to blend fruit and juice but also to power through chunks of ice without being damaged. The handle on the included jar makes it easy to hold onto your drink when your hands are already full. One-button operation makes it easy to use this blender without worrying about different settings for various types of food or drinks. The cord stores directly in the base when the blender isn’t in use, so you don’t have to worry about it taking up too much room. Can be used not only for blending, but also for chopping nuts and other small foods. There are reports of liquid leaking out of the bottom and then into the blender’s base, which will break the unit. Some people have had problems with the plastic parts of the blender not lasting for a long time and tending to break off. Some reports state that the locking mechanism breaks easily, which prevents the blender from working at all. Thanks to the advanced safety feature of this blender, there isn’t any way for it to operate if the blades are not all completely and safely enclosed, which means that you are much less likely to be accidentally injured when using this blender. There are two modes of operation so that you can get the perfect blend on your food, including a one-touch pulse that will allow you to chop food and a twist mode for continuous blending that’s hands-free. While this blender doesn’t have the same level of design as other options do, it’s a great choice if you are interested in a powerful blender that can easily chop through a number of different ingredients. Comes with both a blending and a grinding base. Unlike other blenders that will only make smoothies, this blender can easily grind spices, seeds, coffee beans, and even nuts. With multiple mason jars included, you don’t have to worry about running out of cups to blend or store your foods in. The advanced safety features ensure that young children can’t use the blender and get injured by accident. Can blend hot liquids without fear of the steam causing the jar to break. Only fits small mouth mason jars. There are reports of people having problems with the assembly coming loose and causing the blender to stop blending food at all. Some users struggle with the mason jar adapter and have problems with the blender not providing them all of the power that they need to chop through and blend products. People have reported that the taller jars included with this blender are more difficult to clean, which can lead to people avoiding using them or cleaning them properly. 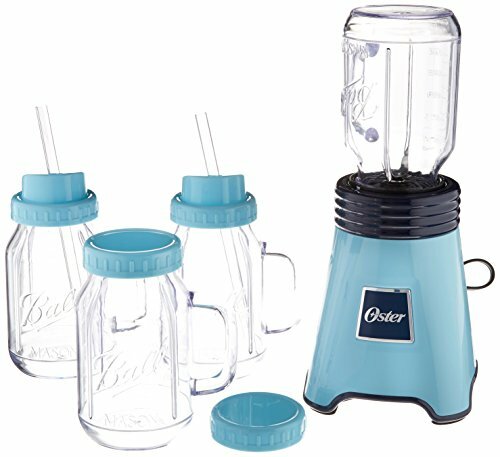 The glass mason jars included with this Tribest blender are incredibly durable and built to last for a long time without cracking or breaking, so you don’t have to worry about them shattering while they are in use or when you have put them through the dishwasher. While there are plenty of mason jars included with this blender for you to use, it also works with other mason jars that you have around your home so that you will never run out of storage space for your blended foods. Larger blending containers make this blender ideal if you have a family and need to blend more food at once. Perfect for taking smoothies with you on the go or for storing food at home for later. The two different blades are very easy to swap out. There are reports of the jar adapter getting stuck on the jar and being difficult to remove. 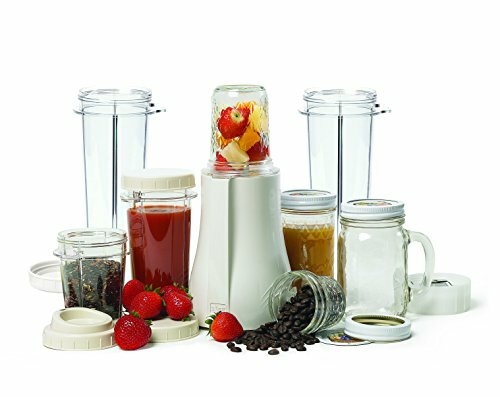 This blender is designed specifically for use with regular-sized mason jars, which allows you to use all of your canning jars for smoothies, juice, and salsa. Unlike most other blenders on the market, this blender is portable, which means that you can charge the batteries and take it with you on vacation, while camping, or simply to the backyard to make smoothies and other drinks. You can charge the batteries with any USB device or plug it into the wall for fast charging. There are six different blades in this blender so that you don’t have to worry about the speed at which you can make a smoothie or blend a cup of juice. This blender is ideal if you want to make smaller portions, as it is much smaller than other blenders that you can buy in stores. The blades will not run if the mason jar is not correctly attached to the blender. The six blades work together to ensure that there are no chunks left in the food that you are blending. The small size of the blender means that you don’t have to worry about it taking up a lot of space on your counter or in your cupboard. It does take three hours to charge the blender completely, which means that you need to plan ahead. There are reports that it is difficult to attach mason jars and get them to fit correctly. Due to the size of the blender, it may not be ideal if you need to make larger batches of food, as you may have to make multiple batches. Like we said though - we don't really recommend using weak mason jar blenders if you can avoid it. You'll be able to get a much better finished product in one of our best blenders of the year -- not to mention the safety aspects. Either way - happy blending!